safe for power tool use. accidents while operating a power tool. saw occur in a home, not on a job site. tool you should remove the battery before changing parts. nothing compared to the loss of your finger. area in which you are cutting. places as you work, and that no liquid can be spilled on it. hand it can result in injury. slipped on a ladder with a power tool in their hands. work on it. The same goes for an unstable surface. from yourself to a safer area where there are no people. 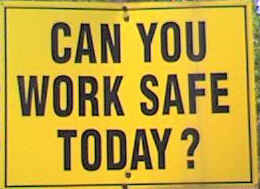 Above all use your common sense and be as safe as possible. and wear the proper safety equipment.